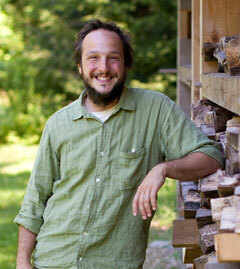 Bryan Felice has been building with natural materials for most of his life. He participated in his first timber frame project in 1999 and continued to gain experience by energetically perusing every opportunity to hone his skills. Inspired by helping on the construction of an earthen home on the Hopi Reservation in 2003 Bryan returned to his native New England and apprenticed at the Heartwood School in 2005. He founded the New Hampshire based eco-design/build firm "Undustrial Timber Frames" and has been building fine custom homes in the Northern New England area since 2006. As well as continuing to run that business, Bryan teaches sustainable building and living courses and skills at Plymouth State University and Colby Sawyer College. He is also the father of 2 daughters and spends time learning and developing homesteading skills with Thea Dodds at their Rumney New Hampshire home. “I first visited an Econest in 2008. I had read the Econest book and been very familiar with the building style, building materials and techniques from my own projects over the past decade. Walking into the home I immediately knew, and felt, the difference between that space and other custom natural homes. I happened to be carrying my newborn daughter, who had been a bit fussy in the car after a long day of traveling before arriving in Santa Fe. The calmness of the home and feeling of sanctuary was immediate for us both." When my business, personal life and schedule allowed, I was finally able to participate in the 3 week Builder training at the Ashland location in 2011. It was worth the wait. I remember being in awe of the cleanliness of the site and sense of ritual of the building community as we ate healthy lunches, cut timber joinery and did morning yoga all on the same outdoor shop floor. It was, in essence, a home building meditation and added a feeling of conviction to my work as a designer and builder. I strive to carry that with me in all of my projects. EcoNest recommends the Affiliates based solely on the training provided at an EcoNest professional building seminars and a completed EcoNest project in the Affiliates home region. The identification of a builder as an EcoNest Affiliate is not intended as a representation, assurance, warranty, or guarantee of the work of an Affiliate on any home the Affiliate may construct for you. Your contract for construction will be with the Affiliate and not EcoNest. It is the sole responsibility of the owner to determine the Affiliate's qualifications . EcoNest does not monitor any Affiliates' compliance with or adherence to EcoNest plans, either stock plans or custom plans, and does not inspect any work either during or after the construction. If your builder did not purchase either EcoNest stock or custom plans, your home may not be identified as an EcoNest home even though it may be built with clay/straw and timber-frame. We recommend that you to seek the advice of an attorney to review any construction contract that you enter into.